This past Spring, as we walked the seminal interior design showcase better known as The Kips Bay Decorator Show House, we noticed a total resurgence of color and pattern - everywhere. It was on the floors, it was on the walls, and it was definitely in the lighting elements. Lampshades took center stage in a big, bawdy way and we were enamored and energized by it! When it comes to adding pizazz to a room, there’s nothing quite like great lighting to shift the tone of your space. Once you find a style of lamp or chandelier that you love, don’t hesitate to take it to the next level by adding a patterned lampshade. 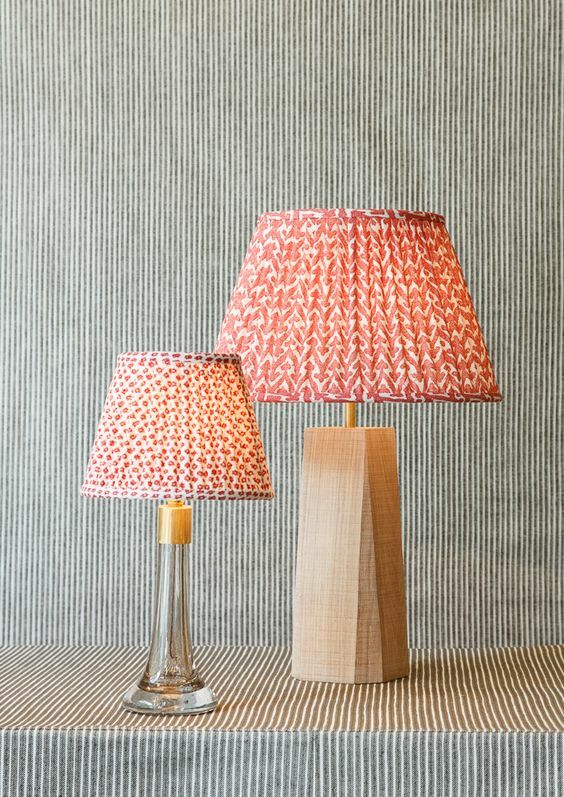 By turns chic and subtly striking, textured or printed lampshades are available in an amazing range of styles and are a snap to swap out, allowing you to effortlessly try new lighting looks. Not sure where to start? Try uniting your design elements by tying together the patterns on your ottoman or pillows with a complementary pattern on your shades. Or take a cue from your curtains and pull in a scaled down version of a similar pattern. Colorfully patterned shades are also a low-commitment way to add excitement to neutrals. The simplicity of substituting a shade seasonally really allows you to play designer in your own space, so be bold, have fun, and embrace your style of the moment. A. HOME is proud to be among only a handful of US retailers who offer Fermoie lampshades in a variety of fabrics, patterns, and sizes. Founded in 2012, Fermoie is the brainchild of Tom Helme and Martin Ephson — best known as the partnership behind the iconic premium paint and wallpaper brand, Farrow & Ball. Both the design and creation of all Fermoie’s fabrics take place at the company’s headquarters in Marlborough, England. They print with pigment dyes in two colors through rotary screens making the effect of melding the color texture into the weave texture, simultaneously creating a unique color. These beautiful lampshades can be ordered 4.5″ to 24″ in bottom diameter. Not finding a shade that truly works with your space? Don’t be afraid to go custom. A. HOME specializes in helping you create truly bespoke designs and sizes in as little as 2 – 3 weeks. Fermoie also offers an elegant assortment of interior fabrics in a wide variety of possibilities: 140 rich colorways designed within families of reds, greens, blues, yellows, and neutrals. The various ticking stripes, chevrons, and herringbone prints—all with a distinctly British feel and quality—are not so unfamiliar to those enamored by Farrow & Ball’s exquisite hand-painted wallpapers. Fermoie’s exclusive fabrics are available by the yard through Ashley Moos Interiors. For the past 6 years, Fermoie has brought new life to the premium textile market and they show no signs of slowing down. Designers from the world’s most exclusive clubs (The Norwood Club and Soho House, among them…) agree — Fermoie is here to stay. Come on in and see what the buzz is all about.